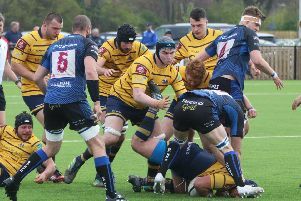 Worthing Raiders Rugby Club head coach Jody Levett lamented his side’s failure to make pressure pay on Saturday. Raiders squandered a 17-3 lead as they suffered a 29-24 defeat to Redingensians Rams at Roundstone Lane. With Worthing on an alarming run of late, Levett felt his side had more than enough opportunities to win the match. He said: “There have been a number of games we have been in front and not able to close out. “We had ample pressure in Saturday’s game, crossed the whitewash on three occasions, but unfortunately weren’t able to get the score and win it. Despite a bad recent run, Levett is confident Raiders can turn things around as they head into the second half of this season. He added: “Form is a temporary thing, but we are not where we want to be be currently. “it is a frustrating time, with injuries still affecting us. Having lost ten of their opening 15 league matches, Levett admits it’s been tough so far and said: “We’ve often lacked consistency and accuracy, as well as some luck at times. “Injuries are always an issue, but with a small squad, we have had a real battle on our hands.